When the snow melts in the Tahoe area, the golf courses green up and become the place to be at the lake. Lake Tahoe has dozens of golf courses, from luxury resorts will all the amenities to smaller, local courses that cater to all budgets. When the snow melts in the Tahoe area, the golf courses green up and become the place to be at the lake. Lake Tahoe has dozens of golf courses, from luxury resorts will all the amenities to smaller, local courses that cater to all budgets. Nearly all the courses have amazing views of the mountains and lake and some have special events and weekly deals. Also, did you know that your ball will fly farther at high altitude? Photos by Reno Tahoe , Edgewood Tahoe, Old Greenwood and the Resort at Squaw Creek. The epitome of golf at the lake, Edgewood near South Lake Tahoe sits right on the shores of Lake Tahoe and even has its own beach. Home of the annual American Century Celebrity Golf Tournament, this course is also open for the everyday golfer. The course has four sets of tees, various sand traps, ponds and a challenging, but fair terrain. Rates range from $140 for weekdays to $200 for weekends. Hot Tip: Edgewood has been rated by Golf Digest as one of "America's Top Golf Courses" and the restaurant is fabulous - excellent food and tables with great views of Lake Tahoe! Directions: From South Lake Tahoe, take Highway 50 north toward Stateline. After the Nevada/California border, turn left onto Lake Parkway and right onto Golf Course Entrance Road. The Lake Tahoe Golf Course is located near South Lake Tahoe in the Lake Valley State Recreation Area near Echo Lakes. It has some amazing views of the South Shore as well as extensive amenities and services. This 18-hole championship course has a full-length driving range, individual and group instruction services, a practice facility, and a rental shop. Hot Tip: This golf course is certified by the Audubon Cooperative Sanctuary. Directions: From South Lake Tahoe take 89 south toward Meyers. Pass Sawmill Road and the golf course will be on the right hand side. The Northstar ski resort has an 18-hole, par-72 golf course that lies within the mountains and valleys of this beautiful area near Truckee. The course consists of 6,781 years, four tee locations, a rental shop, bar and restaurant and group and private lessons. Hot Tip: The Northstar course has some of the best values at the lake. Course fees are only $65 from Sunday-Thursday and $70 on Friday and Saturday. Directions: From Kings Beach on the North Shore, take Highway 267 north toward Truckee. Turn left onto Northstar Drive and right onto Basque Drive. Another ski resort that opens up for golfers in the summer, the Resort at Squaw Creek is surrounded by the peaks that make this area a skier heaven. The 18-hole championship course is an environmentally conscious course and another Audubon International Cooperative member. Green fees start at aroun $99 daily, but you can also hit a few rounds after 3 p.m. for only $59. 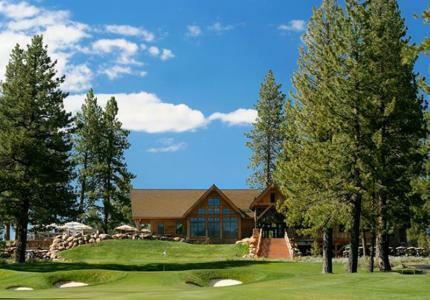 Hot Tip: The Resort at Squaw Creek has $29 golf specials for golfers under age 17. Directions: From Tahoe City, take Highway 89 north toward Truckee, turn left onto Squaw Valley Road and follow the road to the end. Located in the stunning Carson Valley and about 45 minutes from South Lake Tahoe, this year-round 18-hole course sits in a valley with views of the 10,000 foot Job's Peak and offers amenities like a pro shop, practice facilities and a snack bar. Fees are some of the best in the area. Without a cart, weekend fees will only run you about $35. Hot Tip: A 40 minute private lesson at the Carson Valley Golf Course only costs $40. Directions: From South Lake Tahoe take Highway 50 north to Highway 207 (Kingsbury Grade). Take the grade down into the Carson Valley and turn right onto Foothill Road. Turn left onto Centerville Lane. Centerville Lane will take you to the golf course just before you hit Highway 395. As the oldest golf course in South Lake Tahoe, Bijou Municipal Golf Course has its fans. This 9-hole course is small and great for beginners and those on a budget. A round of golf is only $17 and a pull cart is another $5. With views of Heavenly and the mountains of South Shore, this course is great for a quick morning game. Hot Tip: The course does not take reservations, so get to the course early on the weekends. Directions: From South Lake Tahoe, take Highway 50 West to Fairway Avenue and drive south. Look for the signs for the Bijou Municipal Golf Course. Another Carson Valley course, Genoa Lakes has two championship golf courses: the Lakes Course and the Ranch Course. Both of these beautiful courses will take you over varied terrain that includes long drives, wetlands, hills, and over 100 bunkers. These courses are challenging and fun! Rates range from between $60 to $110 depending on the season. Hot Tip: Genoa Lakes golf carts are equipped with GPS. Directions: From South Lake Tahoe, Take Highway 50 East to Kingsbury Grade (Highway 207), turn left onto Foothill Road and follow the road into Genoa. Turn right onto Genoa Lakes Drive. 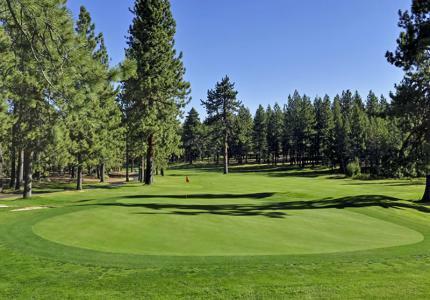 Designed by Jack Nicklaus and close to the town of Truckee, the Old Greenwood is a classic 18-hole golf course. Tee fees run around $150, and you get a lot of amenities for it, including a 2,000 square foot golf shop on the 18th green, private lessons, golf club fittings, and a golf academy. The Old Greenwood was rated among the 10 Best New Public-Access Courses in the Country by Golf Magazine. Hot Tip: After 4 p.m. you can tee off for only $75. Directions: From North Lake Tahoe take Highway 89 north from Tahoe City or Highway 267 north from Kings Beach. Take I-80 eastbound towards Reno to Exit Number 190 on Overland Trail. Turn right. Veer right at Y to enter the Old Greenwood Community, passing the Welcome Gate. Old Greenwood House is located a half mile on the left. Gray's Crossing Golf Course is the sister course of Old Greenwood and was designed by Peter Jacobsen and Jim Hardy. It features a more challenging course in the pine woods around Truckee. This high-end course feels like a private club and includes all the amenities of one. You can purchase a tee package to play both Old Greenwood and Gray's Crossing. Hot Tip: Gray's Crossing has a beautiful restaurant and bar called PJ's with amazing views and mountain architecture. Directions: From North Lake Tahoe take Highway 267 north from Kings Beach to Truckee. Go through the roundabout, and turn right on Prosser Village Road. Turn right onto Henness Road, and left into the Golf Club parking lot. The Old Brockway Golf Course is family-run golf course in Kings Beach with 9-holes and 3,400 yards. The staff and local golfers provide a friendly, hometown feeling. This course is tight and challenging, and right on the lake in the middle of Kings Beach. The fees are reasonable at only $30 for a 9-hole game, or $50 for a 18-hole game. Hot Tip: This course has been around since the 1920s and was the course of choice for the era's Celebrities. Directions: From Kings Beach, take Highway 28 (North Lake Tahoe Blvd) to Brasserie Avenue and turn right. The course is on the left side of the road.